….. AND THE BEST PRICE !!! GET MORE HAMMOCK FOR LESS!!! 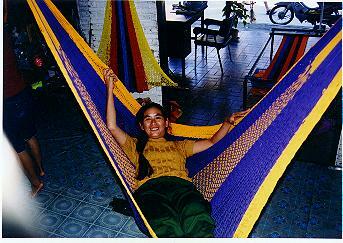 HANDMADE it takes more than 2 days to make one hammock with over 1 kilometer of yarn and more than 5000 loops ! Made with thick extra-strong cotton yarn. Strong enough to pull a truck. Beautifull strong and lively colours. And great designs too !! The original „jungle hammock“ made by the Mlabri (Forest people) tribe of North Thailand. Good resistance to ambers from cigarettes and campfires. 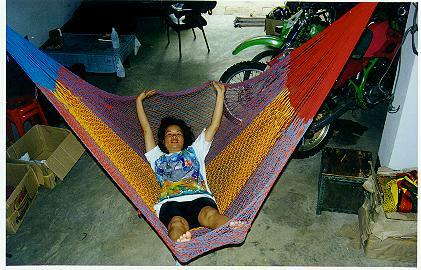 If you like’em strong and heavy this is the hammock for you ! 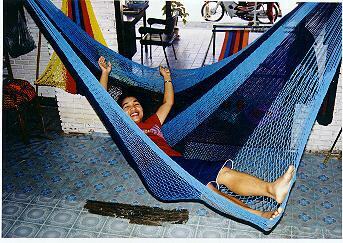 Description: COARSE STRING HAMMOCK handmade with Mexican interlooping technique. Prices INCLUDE shipping and handling. We send by AIRMAIL. Allow approx. 3 weeks for delivery. Price INCLUDES shipping and handling. We ship by SURFACE MAIL. Allow approx. 2 month for delivery. Larger quantities: Please contact us.